No matter what material they are made of, black kitchen countertops can lend touch of sophistication to your kitchen design. If you're planning a kitchen remodel, the first thing you should select after the layout, is the kitchen counter. The countertop in a kitchen is more than just a workplace; it sets the stage for every other decision you make in the design, from the cabinets to the backsplash. There are dozens of choices on the market today in black kitchen countertops. No matter if the style you are striving toward is farmhouse or penthouse, there is a black counter that can work. 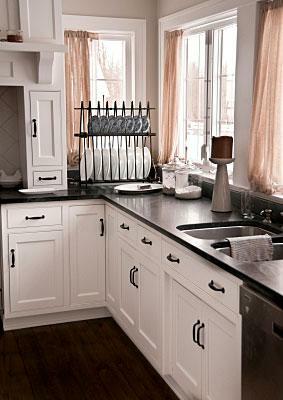 Soapstone is a fantastic choice for both farmhouse kitchens, and for homeowners who enjoy transformations. Soapstone is smooth and chalky in appearance, with light veins and subtle variation. To maintain it you can apply mineral oil to the surface regularly, deepening and enhancing the color. Slate is a great option for rustic kitchens. 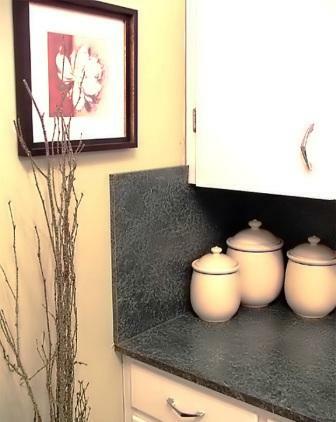 Slate counters have a subtle texture, and mark and scratch easily. Over time, a black slate counter will show the use of your kitchen in a beautiful and unique patina. Quartz counters are a fantastic, low maintenance option for any kitchen, but work particularly well in contemporary homes. Black quartz counters are frequently filled with mica, silver, copper and gold highlights to create a sparkling and eye-catching effect. Solid surface counters, which include Corian, are made of a matte polymer, which absorbs light. A matte, black solid surface counter is a quiet backdrop to a traditional kitchen design. 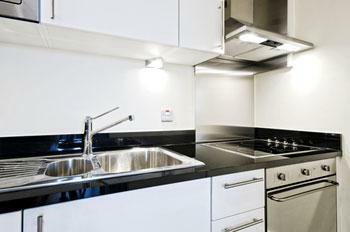 Formica is a cost effective option for bringing a new, black counter into the kitchen. Look for flat black for a truly sophisticated look, or select a counter with subtle veining and variation. You can also paint your existing Formica countertop for a quick kitchen update to get the black counter you want, without the hefty price tag. With so many choices for kitchen counters in rich black colors on the market, you won't have any trouble avoiding the choices below. Black marble does not react well with water. While the black color may look like it will resist staining while providing style, in reality what can occur is worse. Spalling, or flaking of the surface of the stone can occur around the sink area if the stone is not sealed on an extremely frequent basis. If you enjoy veins, consider using Black Cosmic granite instead. Ask the manufacturer of the ceramic tile you are considering if it is graded for kitchen counter use. Some black glazes contain minerals and chemicals that react poorly with lemon juice and other acids, which can mar the look of the counter quickly. Black kitchen countertops can be the focal point or the backdrop of the rest of the kitchen. Choose your counter first to help make the rest of the decisions accordingly, and enjoy your new kitchen and your new counter, for years to come.